FarmCliff is a farm simulation game that has a gameplay that closely resembles another quite popular farm game on Facebook, Dakota Farm Adventures. In this game, you’re put into the difficult position of having to restore your farm after it has been devastated by a massive storm. However, giving up is not an option, and as such, you roll up your sleeves and set off to work! Like most farm simulation games, you’ll get to plant and grow a variety of crops, ranging from sugarcane to wheat and even carrots. You can grow fruit trees too, but they will require buckets of water, while for normal crops, they oddly don’t. There are plenty of adorable animals you can raise in this game as well. You’re given a pen to place all your animals in. It can get kind of messy that way – placing all your animals within the same pen – but personally, I find it pretty convenient since I won’t need to drag the screen around to find my animals or waste precious land by placing multiple pens and coops for each different type of animal. Don’t forget to feed your animals with feed produced at the feeder. You’ll need crops, fruits or grass to produce animal feed. The crops and animal produce you get can then be turned into delicious food at the Kitchen - Food which you’ll need to travel to other locations later on in the game. I’d to point out, however, that the food recipes don’t all contain easily obtainable items. Some items, such as Mortar and Set of Spices, can only be obtained by completing quests and achievements or by receiving them as gifts from friends. Due to the storm, there are also tons of debris and wild plants on your land, and they will need to be cleared. 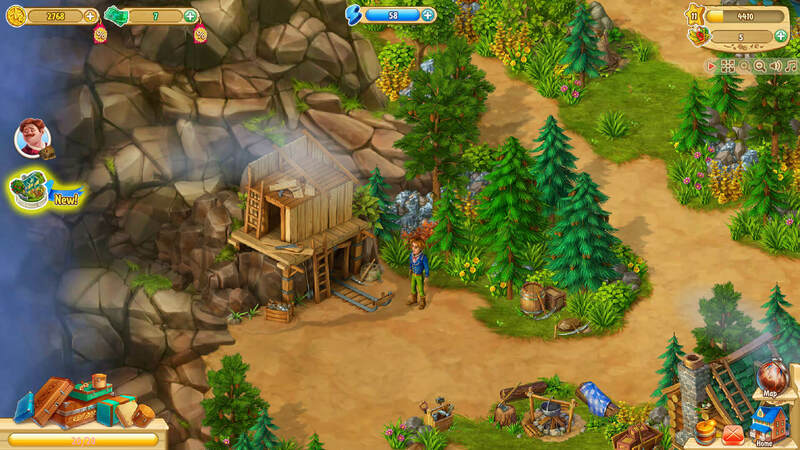 However, you can also collect some crucial resources while removing these items – resources like stone, wood, brushwood, grass and more. Most of these resources will come in handy when you want to craft tools at the Workshop. Tools are, in turn, needed to restore buildings, craft better tools or building materials, and clear away leaf piles on your land. Not all resources can be collected directly from your farm’s surroundings though. You may need to travel to other locations via the Map to gather special resources like needles (from pine trees) and iron ore. Note that you can bring back a limited number of resources per trip. Similar to preparing food, some materials, aside from these special resources, can be slightly more difficult to obtain as well. Everything you get, be it raw produce from your farm or animals, collected resources, or crafted goods from your Workshop or Kitchen, are stored in your Warehouse. Interestingly, there is no storage limit in this game, but if you think you can amass quite a nest egg of items as a result, well, think again! FarmCliff has a rather limiting energy-based system whereby almost everything you do in the game requires energy. The energy meter does refill on its own after some time, thus, this is the sort of game you play for a couple of mins every couple of hours rather than the sort where you can play for hours continuously. That being said, you can spruce up your farm with some décor even when your energy has been drained. Decorations cost coins that can be earned by completing quests or fulfilling orders posted on the Order Board, but in return, it provides your farm with Prestige points which, when accumulated, will unlock new territories and buildings. 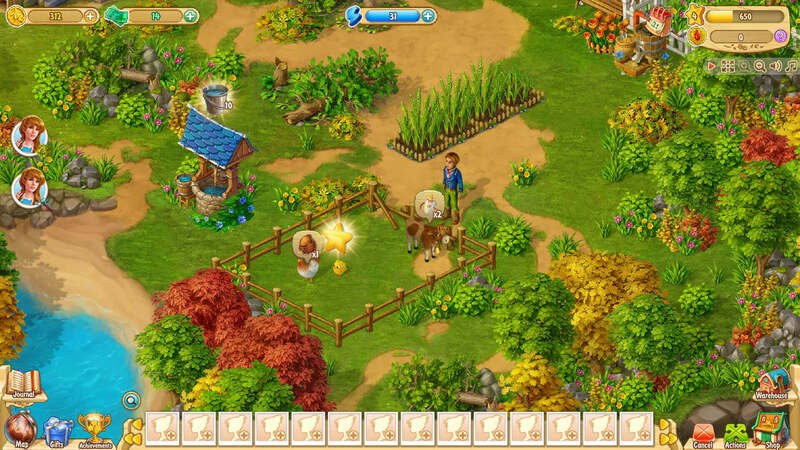 Featuring a pretty entertaining gameplay, FarmCliff is one addictive farm sim to play. 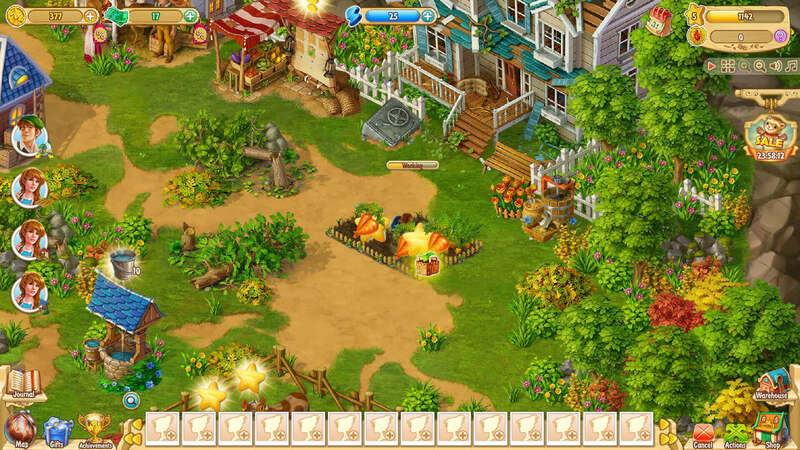 However, the game is rather generic in many ways, especially if you’ve played Dakota Farm Adventures for quite some time (or even until now), and the pace of the game can get incredibly sluggish after you’ve depleted your stock of free energy. After all, you only get so many points every time the energy meter is full… not much.